Cape White turnips are a creamy, sweeter-tasting, more flavorful variety than typical purple top turnips. Find them locally on Martha's Vineyard at Morning Glory Farm or at Cape Cod and Southeastern area winter farmers markets. This recipe sautes the turnip, adding in some kale, and drizzling over bit of honey over both. Simple, and delicious. In a large, thick-bottom skillet, add 1 Tbsp. olive oil over medium heat. Add kale and sauté for 4 to 6 minutes, until tender. Use a pair of tongs to continually turn kale as it cooks. About halfway through, add the garlic and continue stirring. Add a pinch of salt to taste. If the kale is sticking, add a few tablespoons of water. Remove the kale to a small bowl. Wipe out the pan and add 1 Tbsp. butter and 1 Tbsp. of the olive oil (to keep the butter from burning), and the diced turnips. Saute on low to medium heat, for about 20 minutes, stirring occasionally, until the diced turnip is tender and golden. Try one or two pieces to make sure it’s pleasantly tender. Season with salt and pepper. 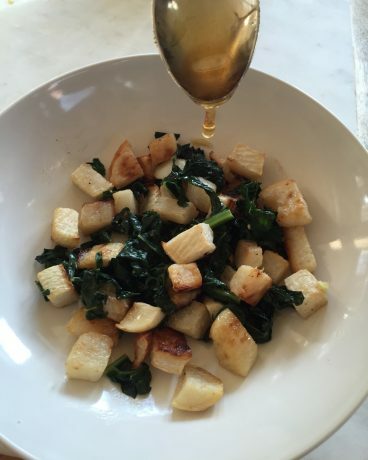 Just before serving, add the kale to the turnips, reheat, and drizzle on the honey. Serve hot.